My wife and I paddled our kayak gingerly into the eaves of a limestone cliff, our eyes scanning its face for some sort of concavity or movement where there was none. “I don’t see where she could possibly be,” my wife confessed. She was right. We knew we had found the right rock, soiled as it was with bird refuse, but there was nowhere for the nest to lie it seemed. Just then, on cue, a stirring of movement. Dark triangles rose out of the rock, followed by the lemony-yellow eyes of a mother Western Screech Owl. She climbed slowly from her grotto before exploding out of the rock toward us. A flurry of feathers rocketed toward us. I’m pretty sure I screamed, ducked as the bird soared away over our heads. We backed off a little. Concerned about the integrity of the nest site and our own well-being, we didn’t want to venture too close. When we were finally far enough away for mother’s comfort, she leap-frogged her way back to the cliff-side and disappeared again into the rock. It’s a wonder she was there at all! Inconspicuous as it is, her placement is nevertheless adjacent to a highly frequented recreational reservoir. As we watched her descend back into her incubation chamber, country music blared from the opposite shore and the joyous yelps of our fellow boaters rang out through the air. To be sure, this wasn’t the first time she had been stirred from her nest; but she must have somehow grown accustomed to human sights and sounds. 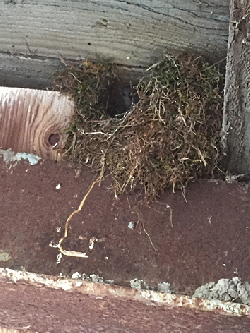 Otherwise, she wouldn’t choose this same nesting site year after year, as I’d heard she does. My wife and I marveled at her bravery in defying what seemed a too-close proximity to our louder, more aggressively curious species; but the more I thought about it, the peculiarity of her choice faded. This was not the first intimate space we had discovered this spring. A couple weeks earlier, as we sat at swift water’s edge, a small charcoal feather-bundle fell out of the sky toward the water near the opposite bank. 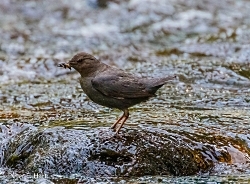 A Water Ouzel—otherwise known as the American Dipper—had just lit upon a boulder where it commenced its famous bouncing. At once, it lunged at the riffles of water at its feet, torpedoing itself toward whatever invertebrate morsel was to be found in early spring. 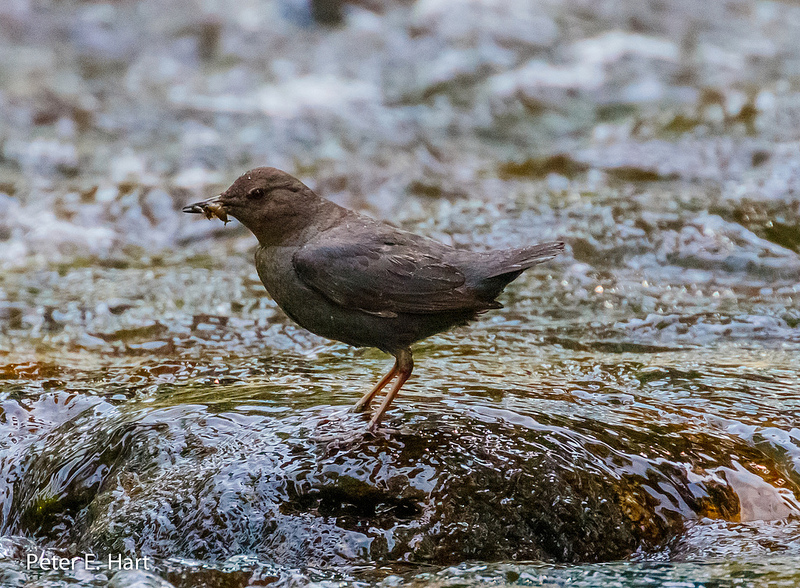 Having fetched what it was after, the dipper surfaced into full flight. I thought it would have returned to the rock; but instead, it swept itself into the girders of the small bridge spanning the river. I waited for what I thought was a polite enough amount of time before investigating the scene. As I peered into the dim shadows beneath the bridge, my eyes adjusted to two others blinking back at me from the rounded doorway of a mossy, gourd-like dipper nest. “Why here?” I wondered aloud. The bird had taken offense to the question and took its immediate leave of my presence. This was the second dipper nest I’d found within a few miles’ stretch of river—the mark of a healthy and robust riparian zone, and perhaps also indicative of a healthy human/nature relationship. The other, too, neighbored a well-travelled recreational space. It seems heroic at first glance, the wild ones enduring our somewhat rude domesticity; but perhaps it’s a complement. They’re comfortable enough to hide in plain sight. Societies and peoples the world over have harbored superstitious fears of owls. In truth, only small mammals and other like-sized prey should tremble in the presence of these fierce, stealthy predators. 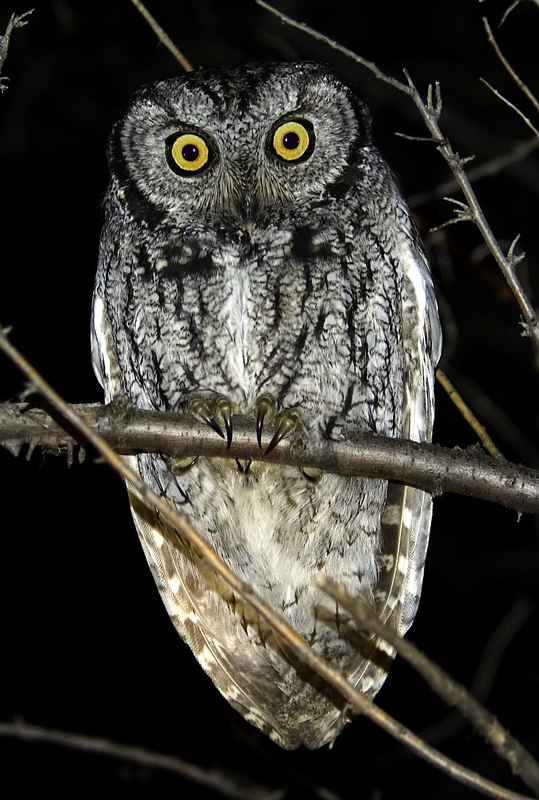 Most owls hunt by night, aided by light-sensitive vision and keen directional hearing. Most owls also call at night, and although not melodic, you can learn to identify owls by their calls. 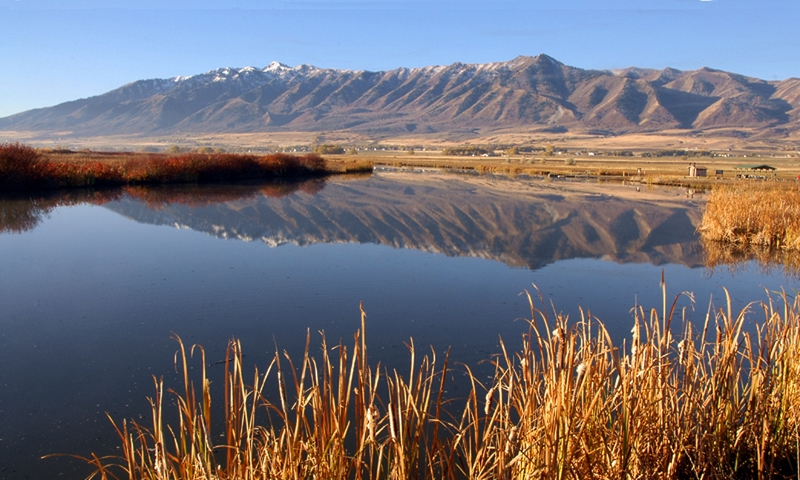 Today I will feature two common owls of the nine species that you can expect in Utah. 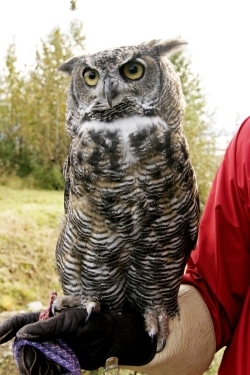 The Great Horned Owl is Utah’s largest owl, the size of a Red-tailed hawk. It’s correspondingly loud and booming call is a series of “who’s”. Great Horned Owls breed early, so expect to hear their hooting duets on our long winter nights. They hunt at night from a tree perch, swooping down to catch their prey. They primarily feed on rodents, skunks and other mammals. My second choice is the Western Screech Owl, one of our several small owls. Its look-alike eastern relative makes a whinnying cry, far different from the Western Screech Owl’s own call, which sounds like a bouncing ball. These smaller owls all feed on mice, voles and large insects. The male calls at dusk. With persistence and luck, you can see these camouflaged owls roosting in the daytime too. Check out flocks of mobbing birds. Crows commonly raise a ruckus around Great Horned Owls, whereas chickadees will fuss stridently around small owls like the Western Screech Owl. 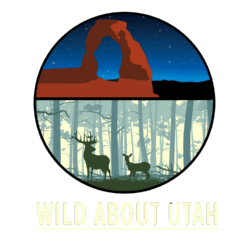 But listening at night remains the best way to meet most of Utah’s owls.